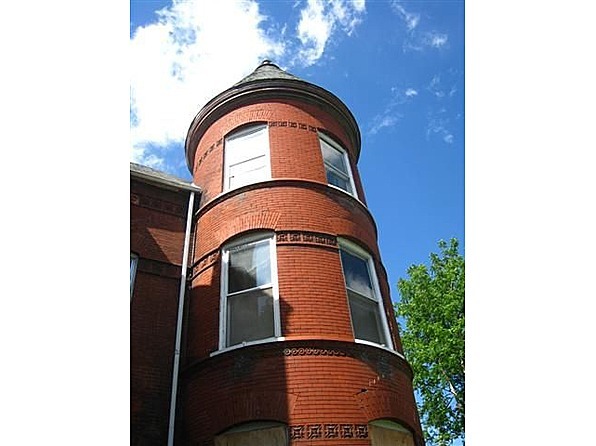 I was a great lady in 1865, built by HH Andresen, a proud example of Richardsonian Romanesque architecture. It broke my heart when I was converted to 12 apartments in the 1920s; my original features like pocket doors & fireplaces were stripped away. My interior is in still in that footprint. I have no working electric, plumbing, heat & need a roof + lots of love! I am being sold "as-is". My best features are nice river views, my original stairway & woodwork remain. I likely will have to be a cash sale, "statement of funds" is needed before I can be shown. Some rehab money available thro city. Gutted, “Shell” houses like this can be found all over the country…Sad indeed! 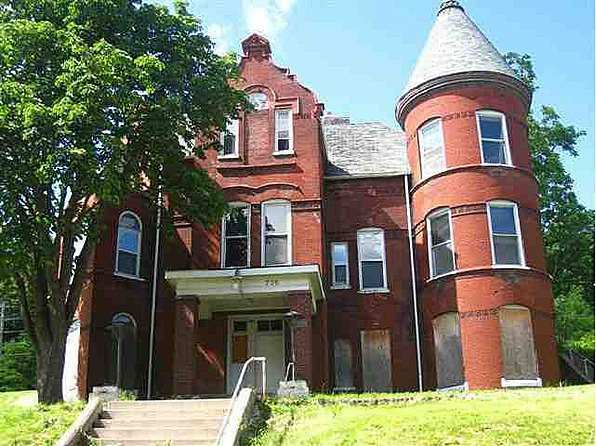 If someone is going to take on a rehabilitation like this, for heaven’s sake please don’t gut it to the bare walls and lose (or, as I have seen before, sell off all the good stuff on e-Bay) the ornate millwork and original interior details. Now this once grand mansion is probably only good for someone to come in and construct modern loft apartments within the old walls. Probably not a lot of demand for that in Davenport, either. Having restored a large 1887 Victorian which had been converted to apartments, such as this home, I can understand why this may have been gutted. My home had been remudled into 9 units in the 1930’s, losing all of the original layout. Some details were saved, though many were discarded at that time of course. The wear and tear and water damage were incredible. We chose to gut and restore to the original floor plan saving EVERYTHING we could of the original. I do NOT recommend that for most restorations, but sometimes one has no choice. 55 grand is still a pretty good price, though, even if it is just a gutted shell. It’s a very attractive shell! 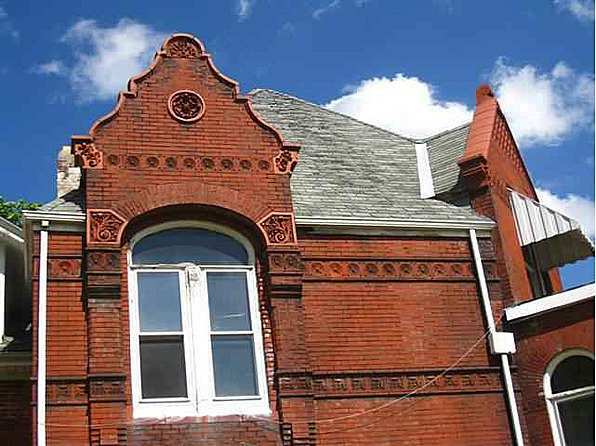 I really like the terra cotta banding and molded elements used on those unusual gables. I’m not entirely sure I’d call this home’s style romanesque myself, but I know for sure I wouldn’t call it “Richardson Romanesque”…well, not if it was actually built in 1865 anyway. 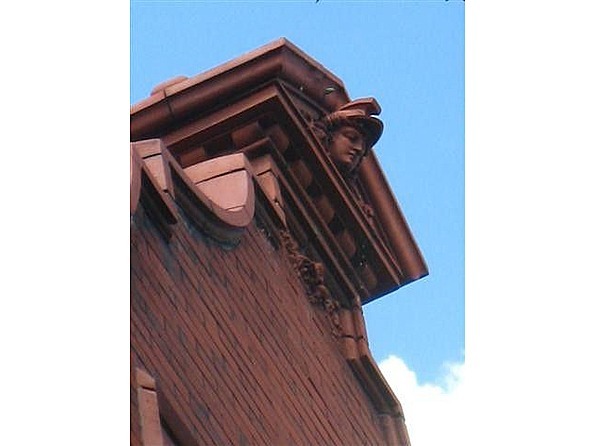 Henry Hobson Richardson’s very first design to use a number of the elements which would later make up his signature style was that of a hospital in Buffalo, NY, and that didn’t occur until 1870. And most of his better known romanesque buildings went up even later, in the 1880s and 90s. I’m wondering if this home’s designer mightn’t have been more influenced by the work of Frederick Clarke Withers, or one of his contemparies. 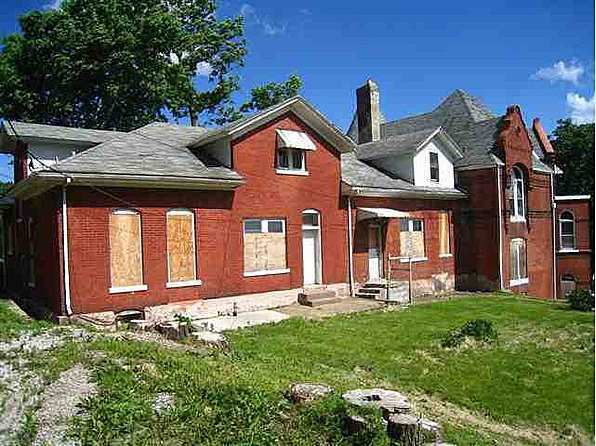 House now has a contract on it to buy it and restore it to 1865 condition. Can’t wait to see the results. It might be gutted but that’s what salvage stores and woodworkers are for……start from new for the old. Such a shame. Thanks for the update, I’ll revise the post to reflect that it hasn’t sold. Relisted today at $40,000 and with some interior pics. And another price drop down to $29,900. While it is in a less than desirable part of the city, it would be amazing to see it restored. JUST BOUGHT THE HOUSE TODAY AND PLAN ON RESTORING TO ORIGINAL WILL POST PICS SOON ON WHAT IT LOOKS LIKE KNOW. I lived in this house from 1995 to 1998 and it was quite a place. Sad to see it has been virtually destroyed. I hope Eastwood can bring it back to it’s original glory! Yes, I found 6 old photos. I can’t upload them to this site though. Can I email them to you? Please provide an email address. I lived in 3 different apts in the house while I was attending Palmer College of Chiropractic. This house was once owned by a professor at Palmer, who is still teaching there. First I lived along the back side in the apt that had its own separate entrance. I believe it was Apt 5. If you enter from the back, it was the first door on the right. The second apt was directly above the main front entrance, I think Apt 3. You could go sit on the “balcony”, which was really just the roof directly over the front steps. The third apt I lived in was the top of the round tower, which was considered to be the penthouse by all of its occupants. I can’t remember which Apt # that was, but it was really cool. I’m cruising through here, in 2014 thanks to the nifty link I discovered up at the top of this blog called photo gallery, then under the faded charmers link. Been reading here for at least 2 years and never noticed that awesome search function! Anyway, when I first read the listing, in my mind, the agent initially used the pronoun I. I assumed it was a typo. I then got to the next I, and wondered if they proofread, by the time I got to the 3rd reference of my and I, I finally got it. It’s late! It’s a new feature, the link has only been there less than a month. I don’t know if it’s an error but I noticed on Zillow this information, “The owner of this property has been served a Notice of Sale. I am so enjoying this new feature. Thanks for adding it! Ok, thanks! Not sure why Zillow is showing that. Eastwwod, how are the renovations coming along? I might be back in the QC for a chiropractic seminar later this summer or in the fall. Maybe I will post a message on this forum and we can meet up for a quick tour. I lived in this house for 3 years and would love to see the progress. Nice job Eastwood, its really cool you have the guts to take on a massive project like this. I noticed someone said the front (pretty) half was built in the 1980’s. There is no way that is true. Perhaps a typo, maybe they meant 1890’s? After years of searching, this is the first mention of the architect. 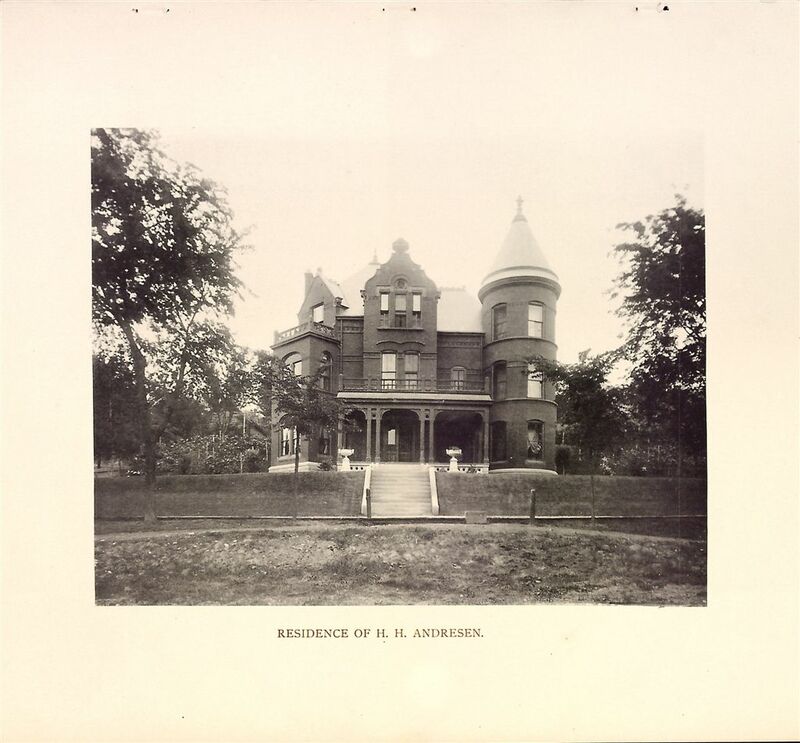 The date of the publication suggest that the house was probably constructed 1885-1886. 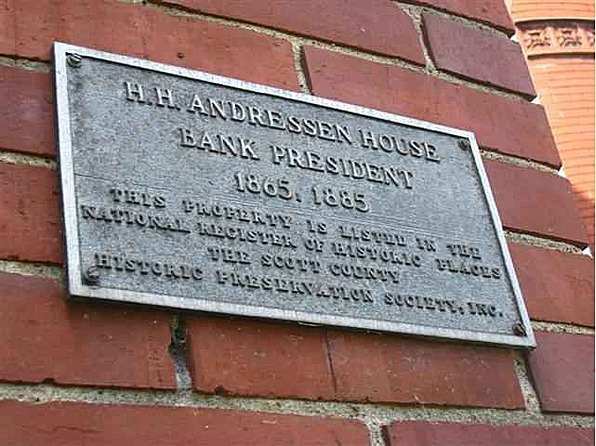 Also worth mentioning is the original owner’s name was H. H. Andresen, the A. A. in this article was a printing error. This is a truly great home, a creative floor plan for a house on a hillside. Wow! It was stunning in that old photo, it’s almost hard to believe it was the same home! Would love to obtain info if you are selling the property. I would try to follow your brother’s dream. I just read a facebook update stating that Chelsea had lowered the price to $5000.00! I see this morning that the house was totally gutted in a fire. Andressen House – 153 years old. Dustin Eastwood, who hoped to restore it, at 32. That link in my last post shows the stained-glass windows that were stored and saved. Unfortunately so many other exterior details were lost. I remember this house in the 80’s when it was still livable and really intact. The staircase and stained glass was totally intact and beautiful as were the stained glass above the windows. It was a relatively easy cosmetic restoration at the time. The interior was very similar to the Beiderbecke house and the house at 712 w 8th street known as the Warnekie home as I recall. The stained glass at the top of the staircase disappeared in the late 80’s. 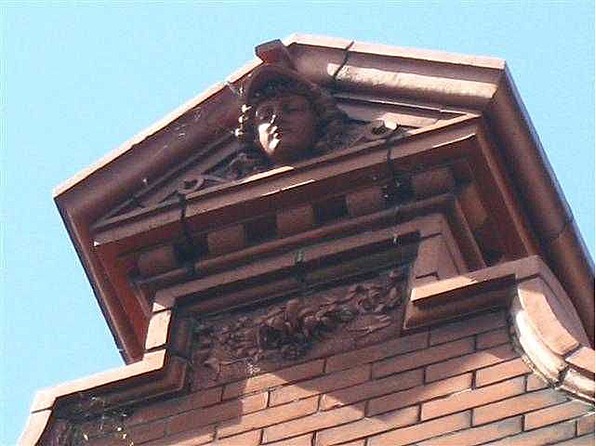 Most of the homes in the area are or were wonderful works of art and very diverse architecturally.